South Ayrshire Council today (Tuesday 26 January) agreed to develop detailed proposals on a new facility to support the regeneration of Girvan and South Carrick. The decision was taken following consideration of a local partnership proposal to operate the town’s swimming pool. Council members were advised that the bid presented significant technical, financial and operational difficulties and so could not be recommended to Councillors as a viable solution for residents in Girvan. Following a motion by Council Leader Councillor Hugh Hunter, Councillors agreed the swimming pool could not be considered as an isolated issue in Girvan and that there is a need to look at leisure facilities, including a swimming pool, as part of a wider strategic view of the health, education, economic, environmental and social needs of the area. Members then approved the development – in partnership with the Girvan Strategic Group and informed by local consultation – of detailed proposals for a new multi-faceted facility in Girvan that would address these needs and also consider toilet requirements and facilities associated with Marina development. A report on these proposals will be brought to Council later this year and Councillors presented with recommendations for consideration. To enhance the general environment of the harbour and beachfront area, Councillors also approved the demolition of the swimming pool and attached buildings, which will allow for the reinstatement of parking facilities and agreed that the dredging of Girvan Harbour should be undertaken early in the 2010/11 financial year. Councillor Hugh Hunter, Leader of South Ayrshire Council, said: “This is a very emotive issue for everyone involved and I fully appreciate the strength of feeling it generates. “Council members gave the partnership proposal, for which I thank the board of directors, our fullest consideration and regrettably it does not provide the robust and confident solution this town needs. 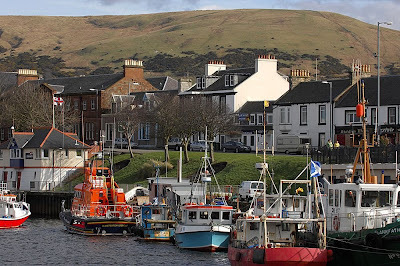 Our priority at all times has to be the wider and sustained regeneration of Girvan and its surrounding villages. “This area is an important part of South Ayrshire and we now have an exciting opportunity to take a strategic and holistic approach that will produce far better outcomes and experiences for people in the local communities who all recognise the potential their town and villages have to offer. And I urge the board of Girvan Swimming Pool Ltd and its supporters to get on board and help drive this forward. “There is a huge amount of potential for partnership working to achieve the type of wider economic regeneration which could help establish a whole host of quality facilities – public and private – that will benefit everyone in this area. “We’re committing £250,000 to take the first steps of the journey to build the momentum that will transform this part of South Ayrshire and create the town we both want and need Girvan to be. Councillor Nan McFarlane, Leader of the SNP Group and Portfolio Holder for Social Services, seconded Councillor Hunter’s motion. She said: “While the community bid looks and sounds good on the surface, the outcomes and uncertainties it offers for local communities in Girvan really are second best. That’s not what we want for Girvan and I’m sure it’s not what the people want either. “A joined-up approach that provides a significant opportunity to explore the wider issues in the area with a view to meeting economic, social and health needs and really making a difference to people’s lives in a practical and tangible way is what the people of Girvan deserve.